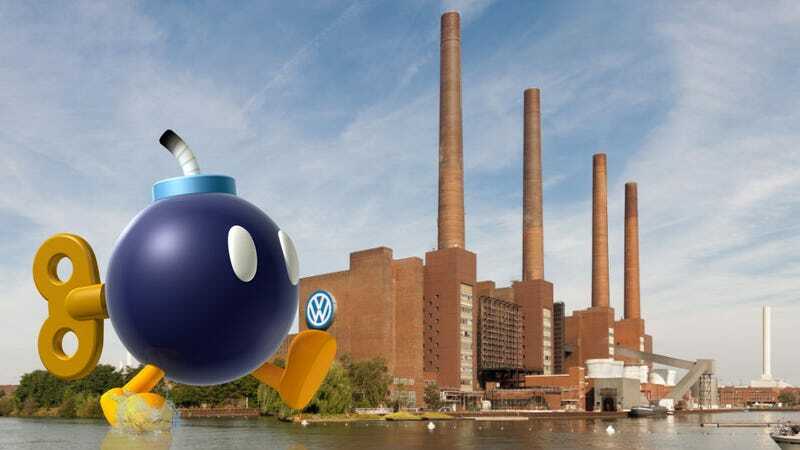 Volkswagen has been expanding their headquarters in Wolfsburg, perhaps as a way of taking their mind off unpleasant things. During early phases of construction, they found an old American import from the ‘40s: a 400 lb unexploded aerial bomb from World War II. As pretty much everyone knows, the history of Volkswagen’s main factory at Wolfsburg is, um, checkered. Originally built in 1938 as the factory to build the Kraft durch Freude (in English that means, creepily, Strength through Joy) Wagen, the car that eventually became the VW Beetle, the factory and the town around it (known as Stadt des KdF-Wagens bei Fallersleben, which is now Wolfsburg) during the war produced primarily military vehicles like the Kubelwagen and Schwimmwagen. These military vehicles made the factory a prime target for Allied bombing raids, which did a lot of damage to the factory, though the factory remained more or less operational throughout the war. With that in mind, it’s not too shocking that there may be some forgotten ordnance left around. During excavations prior to the start of construction, four suspicious metal objects were found, but only one proved to be an intact bomb. A Wolfsburg-area news site says that the bomb was easily defused by an explosives expert, and there were no injuries or complications. The bomb is referred to as a “standard bomb for the Americans,” and you can almost hear the bored yawns of the bomb squad, who seem to have taken all this in stride. That’s not too shocking, since I expect this is a much more common occurrence than, say, when Volkswagen built its plant in Tennessee.